Congress, BJP Boycott Kerala All-Party Meet Ahead Of Sabarimala Opening. Chief Minister Pinarayi Vijayan said needs to be discussed if women can be allowed on particular days. ahead of the two-month long annual ‘Mandala Makkaravillakku’ or the pilgrimage season, set to start on November 17. We have to see if particular days can be fixed for women. The Supreme Court clearly said that the September 28 verdict stands and that means women should be allowed. Chief Minister said after the two opposition parties walked out of the meeting. 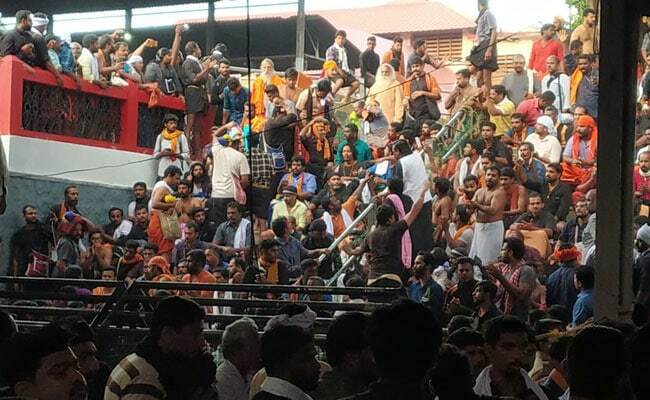 The political stand-off over Sabarimala comes amid sparring of activists over the past few days. Nearly 500 young women have registered on the website of the Kerala police, for darshan, over the last one week. She said Ihave not received any response from the Kerala government. who is opposed to entry of women in 10 to 50 age groups, promised to fight Ms Desai tooth-and-nail to prevent her from entering the shrine. Chief Minister Pinarayi Vijayan earlier accused the BJP and the RSS of conspiring to create trouble at Sabarimala. The odious politics and perfidious ways of the BJP stand exposed. Evidence has surfaced that BJP leaders in the state connived to create trouble. Supreme Court is lifting ban on girls and women in 10 to 50 age groups, from entering the temple. While the BJP took out a rath yatra called ‘Save Sabarimala Campaign’, the Congress organized padyatras across the state, starting from five locations. The Sabarimala temple saw a string of protests when it opened for monthly pujas for five days in October and two days earlier this month. Not a single woman in menstruating age groups has been able to enter the shrine so far. Government stating that it never interfered in religious matters and rituals at Sabarimala temple. with their own agenda staged protests condemning the judgment of the Supreme Court and obstructed women devotees from entering the temple.